2 0 1 9 T E C H G U I D E 17 By Kevin Hoffman, Editorial Director Telling score might be the least impressive feature of scoreboards these days. If your stadium doesn't have the ability to play back in-game highlights or update scores from throughout the conference, you might be behind the curve. An athletic administrator's first thought might be that such significant upgrades are too expensive for the program, especially since budgets are still in recovery after suffering major cuts during the economic downturn. There's no arguing that state-of-the-art video boards can require a huge financial commitment from schools, but if planned correctly districts can turn it into an investment, turning a profit over time. 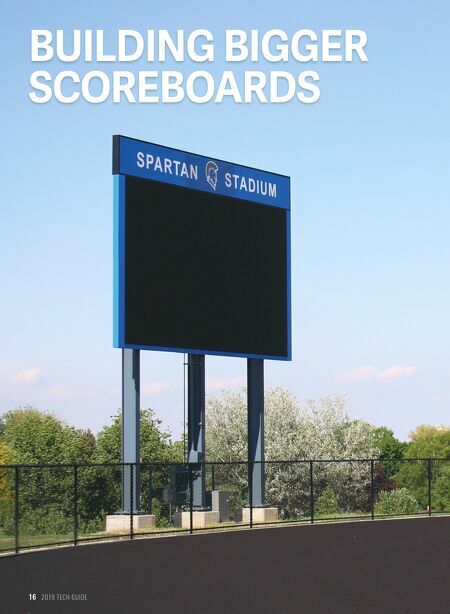 Here are four tips that might help your program gain school support in purchasing a new scoreboard for your facility. 1 Make inroads with local businesses. The key to landing an impressive new display for your stadium or arena is in advertising and sponsorships. And athletic directors who have been down this road know that it's not as easy as calling up the local auto dealer and asking them to mail a check. If you haven't already, develop relationships with businesses in your community, especially those that are local and rely heavily on your community's support to stay up and running. The school district and businesses both require support from residents, so develop ways you can help one another. Business owners want to know you're not just calling them when you need something. The relationship must be reciprocal. If you already have these types of relationships in your community, you're off to a great start. 2 .Create a detailed plan. Asking your school board .or board of directors for a $50,000 check is a lost cause if you haven't developed a plan detailing why it's a worthwhile expense for the district. Nobody needs to have a scoreboard that updates statistics throughout the game, so if you're going to frame an argument for such a purchase, you have to describe why it's a smart decision. Most importantly, that plan should include revenue projections through sponsorships or advertising. Also call attention to any cost-saving measures or cuts that can be made in the budget to alleviate some of the pressure. For example, maintenance on the existing, outdated scoreboard might be increasing every year. The key is to present the purchase as an investment. 3 .Find the money. Whatever cannot be covered in the .budget must be made up for through sponsorships and advertising revenue. At the same time, you need to look out for local businesses and make sure they're getting enough bang for their buck. If not, you'll sour the relationship and possibly lose their support. The scoreboard draws the eyes of everyone in the stands, so it's a sweet spot for advertisers who seek maximum exposure. Some athletic administrators have sold businesses on static signage for five- or 10-year contracts. You can package the advertising with other locations throughout the facility to draw more revenue or interest. If your scoreboard will include a video screen, you can also sell graphic advertising that displays during key moments of the game — halftime of a basketball game or after every quarter during a football game. That should provide more than enough opportunities to draw interest from local businesses. 4 .Explore educational opportunities. Scoreboards .these days are capable of a lot, but like any piece of technology they need someone to operate them. You could pay for a scoreboard operator, which would be another hit to your budget, or you could create a program that gives students real-word experience using television cameras and operating high-tech equipment. New Caney Independent School District in Texas does just that. Brent Sipe, the district's director of sports activities and facilities, uses students to help run the scoreboard and other game day activities in the district's $20 million stadium. They run the cameras, play commercials on the video board and work the control room with the help of adult supervision. It's beneficial to anyone with interest in a broadcasting career. "Some of these kids have done this for three or four years, and they're using equipment that ESPN and the local networks use," Sipe said. "They can step right into the market place, or if they want to go into college and pursue a degree in that field. "I watch them sometimes during a ball game and I'm just in a constant state of amazement at how quick these kids grasp this stuff." 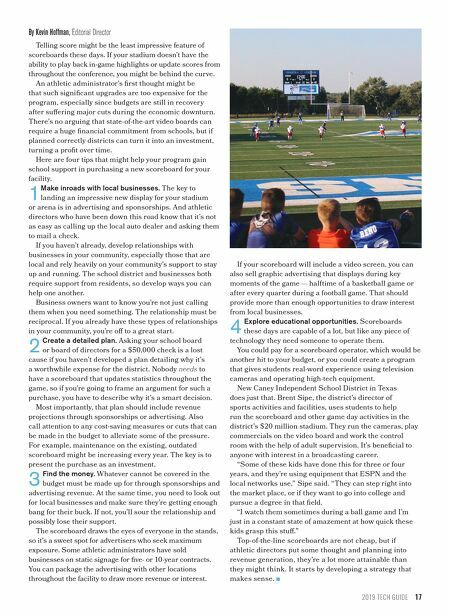 Top-of-the-line scoreboards are not cheap, but if athletic directors put some thought and planning into revenue generation, they're a lot more attainable than they might think. It starts by developing a strategy that makes sense.